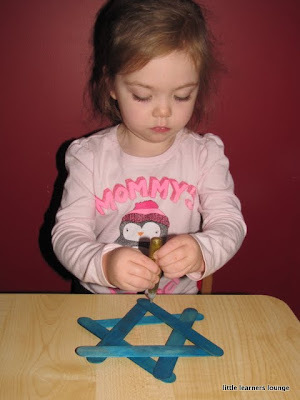 Today we made a Star of David using craft sticks. (I found a pack of multi-colored craft sticks at the Dollar Store but you could always paint or color plain sticks with markers.) I set things up for Eva by placing glue dots on the ends of some of the sticks to hold the triangle in place. Eva did a great job of connecting them to form two triangles. Then I added a few more glue dots to attach the two triangles together. Eva then used gold glitter glue to decorate the star. We set it aside to dry and then added some string to hang it up. We also gave the orange play dough a sendoff by playing with it one last time using some Hanukkah cookie cutters I found at the Christmas Tree Shop.